JACKSONVILLE, Fla. - Forecasters say chances for the first tropical weather system of the year in the Gulf of Mexico will become the season's first tropical storm have increased to 90 percent over the next two days. An Air Force Reserve reconnaissance aircraft is scheduled to investigate the low this afternoon. According to the National Hurricane Center, satellite images and surface observations indicate that the low pressure system located over the northwestern Caribbean Sea just east of the Yucatan Peninsula of Mexico has become better defined overnight, and thunderstorm activity has also increased and become better organized. Environmental conditions are forecast to steadily become more conducive for development, and a subtropical or tropical depression or storm is likely to form by Saturday over the northwestern Caribbean Sea or the southeastern Gulf of Mexico. 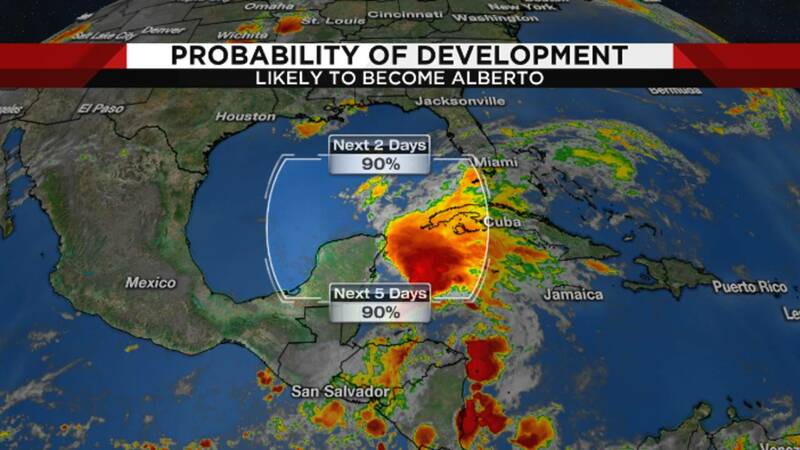 The first tropical storm of the 2018 Atlantic hurricane season will be named Alberto. Locally heavy rainfall is forecast across western Cuba and over much of Florida and the northern Gulf Coast into early next week. This system could also bring tropical-storm-force winds and storm surge to portions of the northern Gulf Coast by late this weekend or early next week. In addition, the threat of rip currents will steadily increase along the Gulf Coast from Florida westward to Louisiana over the Memorial Day weekend. Cooler Gulf water temperatures would make any intensification into a strong tropical storm or hurricane difficult this time of year. Gov. 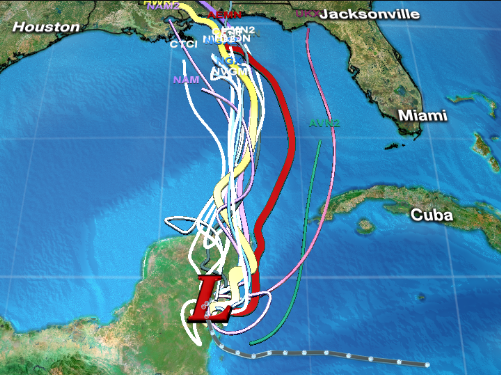 Rick Scott received an update Thursday from the National Hurricane Center. He had already directed the Florida Fish and Wildlife Conservation Commission to put high-water vehicles in position to respond in case the system causes problems in the state and said that all 5,500 members of the Florida National Guard are available for deployment if needed. “We know that many families have travel plans this Memorial Day weekend but everyone has to put safety first and remember to never drive in dangerous conditions or through standing water,” Scott said in a prepared statement. 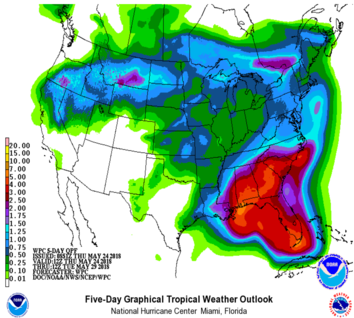 "This storm is expected to bring torrential rain and significant flooding in communities across Florida. We will continue to monitor its path and do everything we can to make sure our state is fully prepared to keep everyone safe." The EURO model has constantly tracked a closed low in the south central Gulf on a track toward the northern Gulf states on Memorial Day. The GFS shows a system closer to Tampa, but this model has been more random. Shearing winds aloft may inhibit the system from developing pure tropical features, which would create more flood-related threats as opposed to wind or waves. Models indicate Jacksonville could get 2-4 inches of rain over the next five days, while 6 or more inches of rain is possible west of I-75, closer to the low that will likely move ashore between the Florida Panhandle and Louisiana. Timing is rather fluid for the start of the rainfall on Sunday, but expect a rainier day than not. 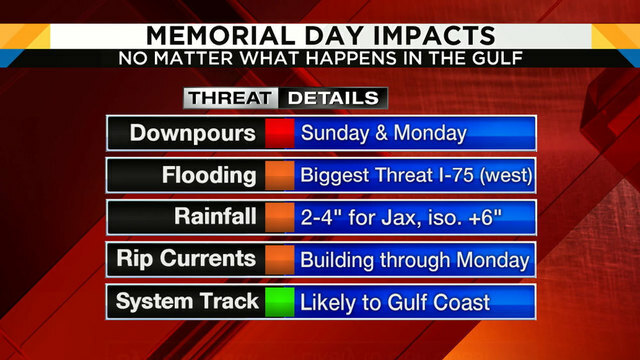 Those storms will continue into Memorial Day. No winds or tidal flooding is expected to impact Jacksonville.